We popped out on a busy intersection with many tourists right in front of the entrance of the post town. 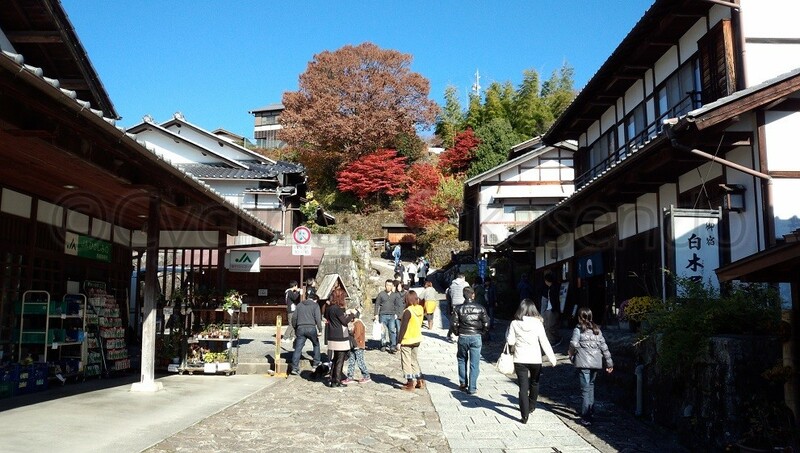 Magome was the 43rd post town from Nihonbashi in Edo. The sign at the intersection says 206 km to Kyoto and 324 km to Edo. 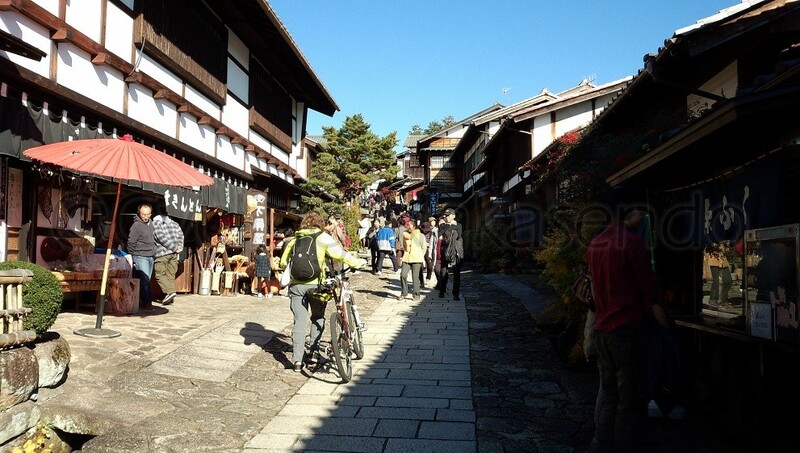 Since use of bikes and other vehicles on the stone paved main street of Magome are prohibited during daytime, we got off our bikes and walked up a masugata which was originally stone stairs but had been modified into a slope in 1905. Restored stairs and a waterwheel on the side of the slope is now a famous photo taking spot for tourists. While many pictures in leaflets and travel guides are taken from the top of this masugata, this iconic view of the old post town and the mountains behind it is obviously finer through real eyes. We took pictures like all the other tourists did, trying to avoid capturing others in the photo frame however it was completely impossible to achieve. 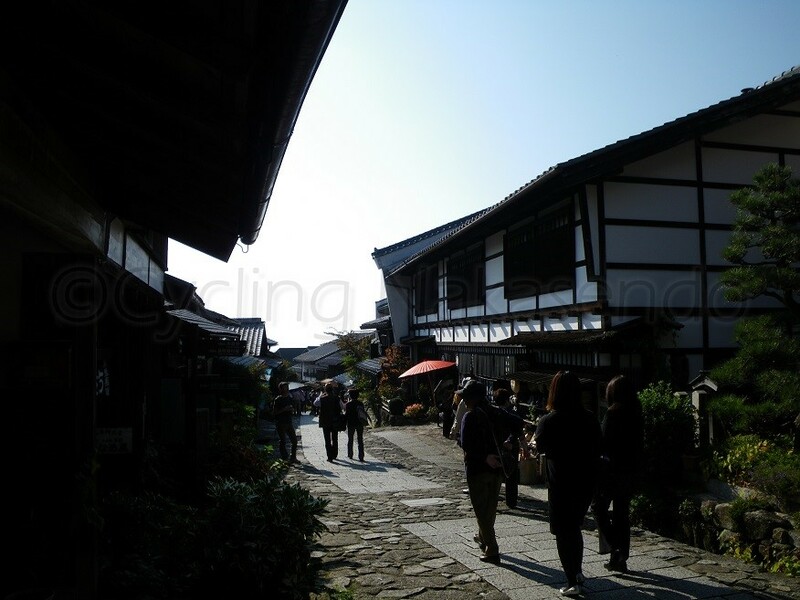 The street was packed with many tourists because it was a sunny Saturday afternoon. We hiked up the hill with our bikes at the speed of a turtle through the crowd, looking for something to eat. Rows of old style buildings on tiers of masonry along the slope were astonishingly well restored after conflagrations in 1895 and 1915 burnt down most of the old buildings. 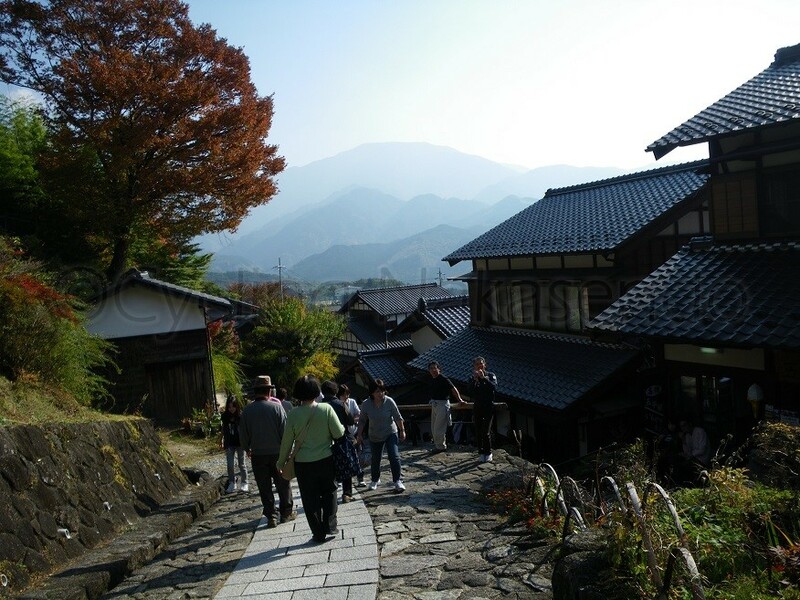 Fires occurred frequently in the past because it was difficult to reserve enough water to extinguish them as the entirety of Magome-juku was built on a steep mountain ridge. The area climbs 67 vertical metres over the 680m of its street length. There were many shops, restaurants and cafes along the street but they seemed to be very touristy. NC bought roasted chestnuts and we also snacked on local products such as chestnut ice-cream and oyaki as we weren’t that hungry. If I consider how much energy we used over the consecutive hills to get to where we were it doesn’t seem as though that would be enough food but, since we worked hard, our bodies probably did not feel hunger to conserve the blood flow to our stomachs. We spent a pretty long time having snacks and resting by the side of a small water reserve where carp were swimming in a channel of clear flowing water. By the time we reached the top end of the street it was almost 2:30pm. 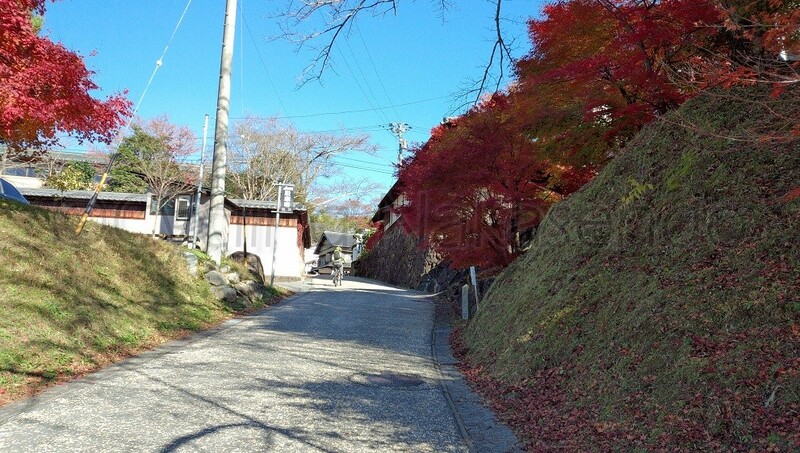 There was kousatsuba across the road and a stone pavement leading to Kamijinba, where Ieyasu Tokugawa made an army camp in order to attack Magome Castle, while it was guarded by the Toyotomis in 1584. 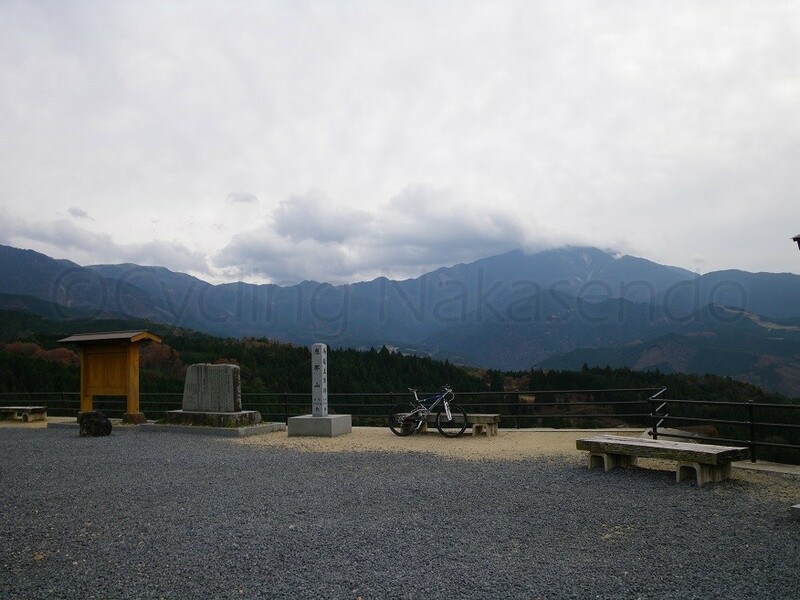 Now Kamijinba is a big square and the last lookout to the side of Mino plain. 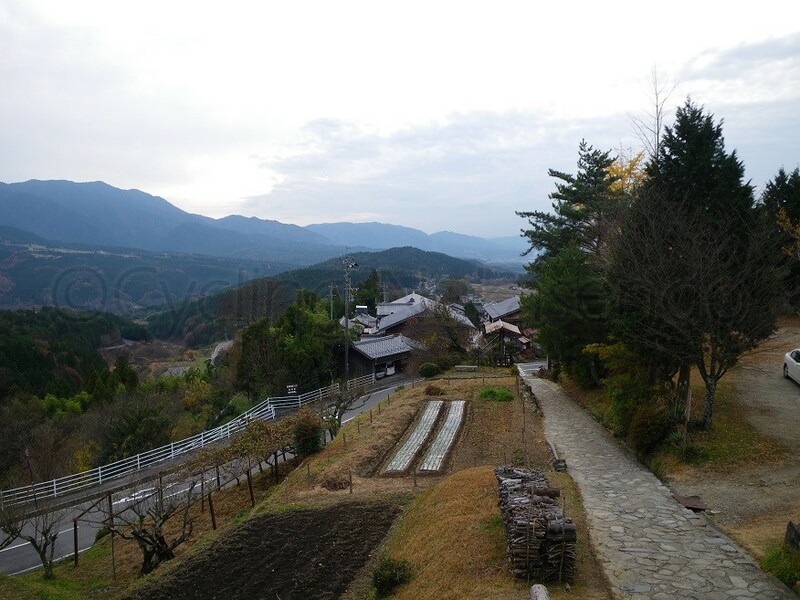 People that arrived at this point who traveled from Edo probably felt a sense of relief knowing they had made it past the mountain roads of Kiso, while travelers heading in the opposite direction most likely braced themselves for the difficult journey ahead.